This soda has blue in spades. If I left a puddle of it on the sidewalk next to windshield wiper fluid, my toddler wouldn't know the difference until the vomiting started. Moving on, however, I will say that this iteration of cream soda isn't bad-it's just completely mediocre. When I was a kid growing up on the wooly streets of the East Side of Toledo, we had a discount grocery story known as Aldi that was frequented by the denizens of my neighborhood. In this particular grocer's stock was a bevvy of generic-brand sodas(some of which I would love to revisit and review), and Dad's Blue Cream Soda tastes exactly like their version of cream soda-which I believe was called Swiss Creme and featured a blue can with white mountains and red writing-which is a strikingly similar design style that you see above. It's exactly what you expect to find in a cream soda. 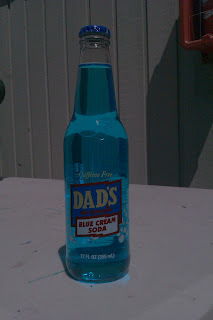 It's funny that a national brand(that used to be second only to A&W for root beer) seems to have taken a generic formula and added blue food coloring to market a different version of cream soda. It smells exactly like fizzy vanilla ice cream. Dad's has always had this dated look(it's packaging hasn't changed much since it's inception), and the stark comparisons to be drawn with it's virtual clone leave a bit to be desired. It's exactly like how all Dr. Pepper imitators use the same brick reddish-brown color on their packaging. I'm surprised at how disappointing Dad's brands have been for me in my adulthood, but maybe that's why it's called Dad's-because it sounds like a special treat from the male parent to his expecting children-Mom's Apple Pie and Dad's Root Beer. Children love it, adults-not so much. Swiss Cream was a soda made by Canfield's, now out of business. That blue can you describe was their can, not Dad's Root Beer.